Volume one cover of the two-volume collection. Volume two cover of the two-volume collection. 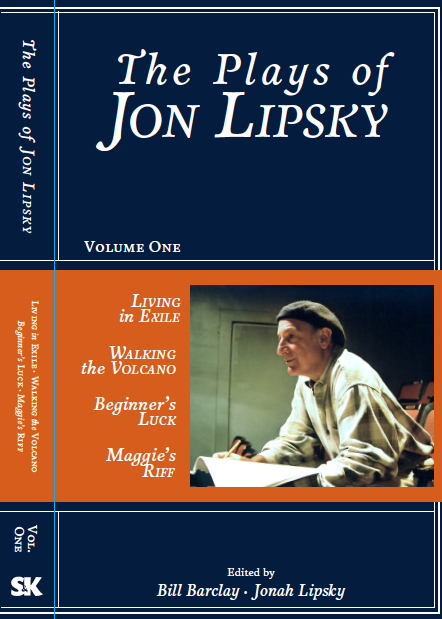 The plays of Jon Lipsky are now available for purchase on Amazon, or directly from the publisher’s warehouse! The finest plays of writer, director, and teacher, Jon Lipsky, are published for the first time in this two-volume collection. Professor of Acting and Playwriting at the Boston University School of Theater, Lipsky spent over three decades as a luminous voice in the Boston theater community, forging an international career as a playwright and a pioneer of dream-based theater. Insightful and colorful essays frame each volume and introduce each of the plays, composed by several of Lipsky’s closest collaborators: Tim McDonough, Kate Snodgrass, Vincent Murphy, MJ Bruder Munafo, Robert Bosnak, Stan Strickland, Susan Thompson, Arnie Reisman, Debra Wise, Bill Barclay, and Jonah Lipsky. This is the home on the internet for the dramatic works of Jon Lipsky. Welcome! A list of Jon’s plays can be found under “Major Works.” If you are interested in the forthcoming collection of Jon’s plays, or in his book on dream theater, go to “Books.” Please do not hesitate to Contact Us (Jon’s family) with inquiries about his work. You can see photos from productions of some of Jon’s plays in the Photo Gallery. To read a short Biography of Jon’s life and work, go to About. A listing, with reviews, of Jon's major plays. Jon created many wonderful short plays on science themes for Boston's Museum of Science. Find out how to acquire rights to perform a Jon Lipsky play.